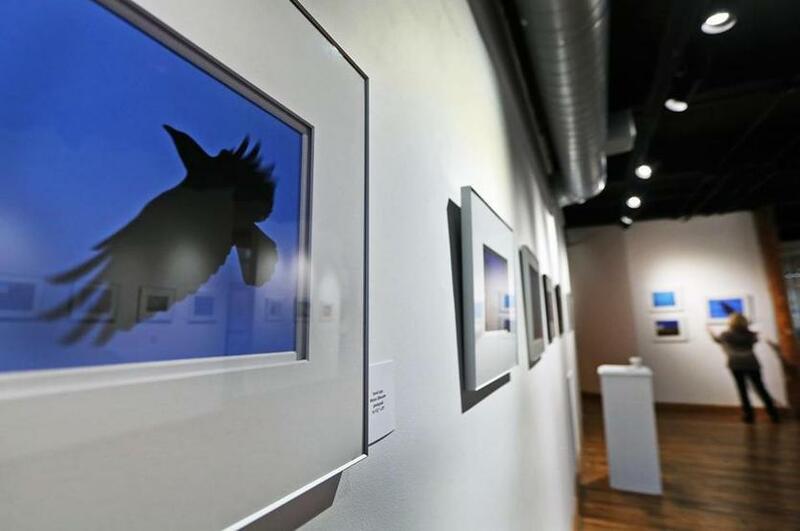 A photo by Craig Gibson titled "Silhouette Full Moon" is part of an exhibit about crows at the Essex Art Center in Lawrence. It’s almost sunset in Lawrence when thousands of crows flock across an orange sky and land in the Essex Art Center parking lot. From there, they fly into leafless trees along the Merrimack River, where they will roost for the night. The ritual is repeated from October to April, with as many as 26,000 crows observed this month. For more than two decades, visitors and staff at the art center have stopped to gawk at the annual phenomenon. This year, it’s been turned it into art. 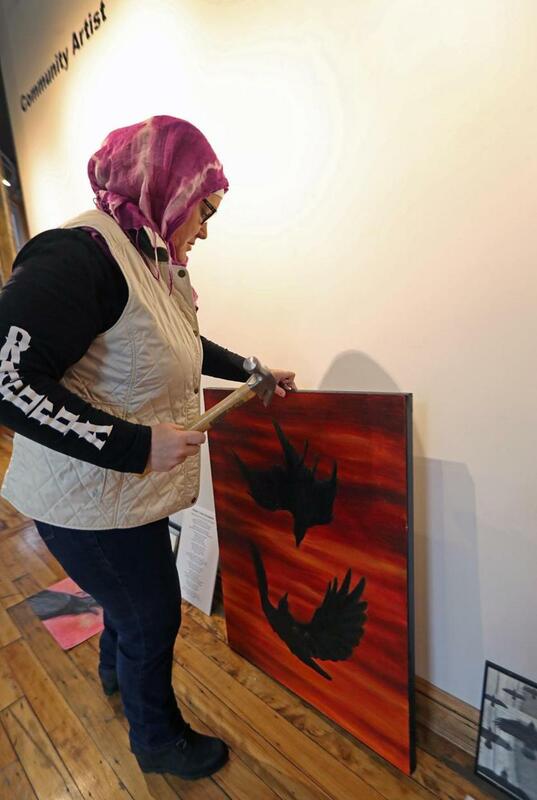 On Jan. 11, the art center opened three exhibits devoted entirely to crows. “Murders and Other Flying Things” and “Celebrating the Winter Crow Roost” feature video and photographs, while another displays crow-themed art by local artists. Crows were first reported roosting in Lawrence in 1989, according to Dana Duxbury-Fox of North Andover, who has long watched and studied birds with her husband, Bob Fox. The city attracts two species, theAmerican crow and the fish crow. Crows can be seen flying in the sky near Lawrence’s South Common at sunset. No one knows why crows congregate in Lawrence, but Duxbury-Fox hypothesized that cold winter farther north causes migrating birds to flock to the city in search of food. She also noted that the great horned owl — which preys on crows — is absent in the city. 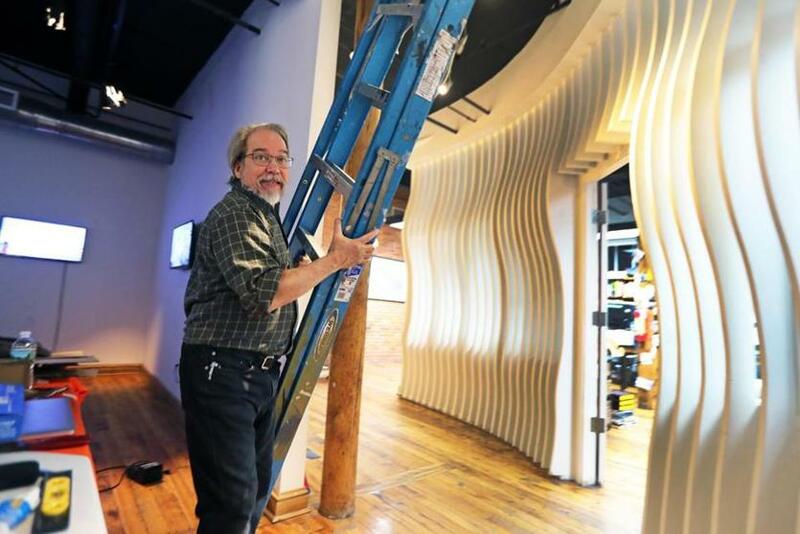 The Essex Art Center already provides a front-row seat to the living phenomenon. 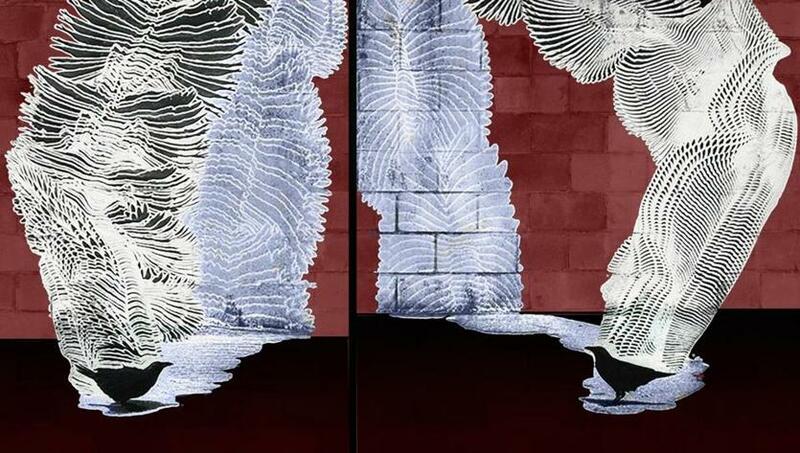 Now visitors can view the birds through the eyes of artists as well. Each photographer ventured to Lawrence at different points of the roost last year and documented them swirling in the air, roosting at sunset, and hanging out by the Merrimack River. Some work was shot as recently as December. Dennis Hlynsky of Providence filled one gallery with six looping videos of birds in flight. Hlynsky said he enjoyed seeing the intersection of Lawrence’s milltown architecture with the natural world. Dennis Hlynsky adjusted the lighting on his video installation about crows at the Essex Art Center. 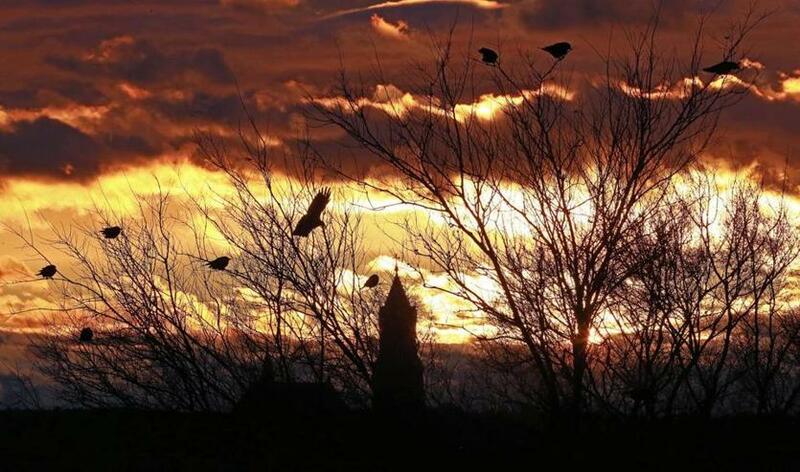 Hlynsky recounted “crow hunting” throughout the city, waiting at parks, bridges, and the Immaculate Conception Cemetery to obtain his best footage. His videos show the geometric shapes traced by the crows’ flight patterns, which he reveals through electronic imaging techniques. Another gallery showcases 25 photographs of crows taken by Craig Gibson, John Blout, David Lipsy, Jim Renault, and Sandy Selesky — all experienced nature photographers. Gibson helped spearhead the exhibition through his own interest in the Lawrence roost. 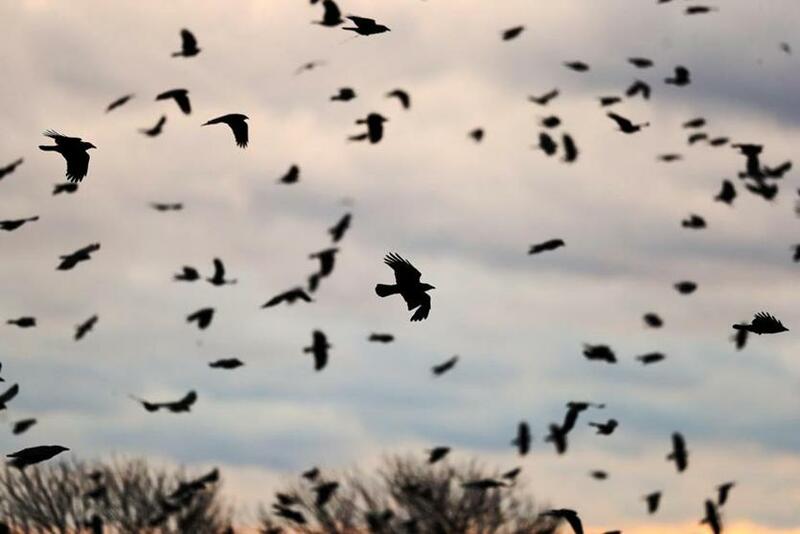 Despite working for years as a chaplain at Lawrence General Hospital, the Winchester resident never knew about the phenomenon until 2017, when Fox and Duxbury-Fox asked him to join them as they watched the crows roost. The art center’s executive director, Cathy McLaurin, remembered hearing about Gibson’s work as a bird photographer when she was planning this year’s exhibition schedule. Amazed by the crows’ connection to the art center itself, she contacted Gibson about possibly creating an exhibit around the roost. Once Gibson explained the phenomena in more depth, McLaurin decided to make the crow exhibition a reality. As many as 26,000 crows have been observed in Lawrence this month. Gibson invited the photographers to capture images of the crows in Lawrence for the exhibition. Gibson, Fox, and Duxbury-Fox have started a blog, www.wintercrowroost.com, that documents their sightings and links to scientific articles. Although the size of the Lawrence flock has been estimated in past years as 15,000, Duxbury-Fox said her husband counted 26,000 this month. Fox and Duxbury-Fox also lead a free series of guided walks of the roost for the public. The next one is scheduled on Feb. 2. Duxbury-Fox welcomed the art center’s exhibit, noting that Hlynsky’s slow-motion videos gave her new insight into the crows’ behavior. The digital image “Two Crows Land Differently” by Dennis Hlynsky is part of the exhibition “Murders and Other Flying Things” on display at Essex Art Center. The crow roost continues to mesmerize Gibson. Just a few weeks ago, he watched the roost with the Foxes and 20 others from the Senator Patricia McGovern Transportation Center garage, just under a half-mile away on the other side of the Merrimack River. He said he’s grateful Lawrence does not try to rid the city of crows. 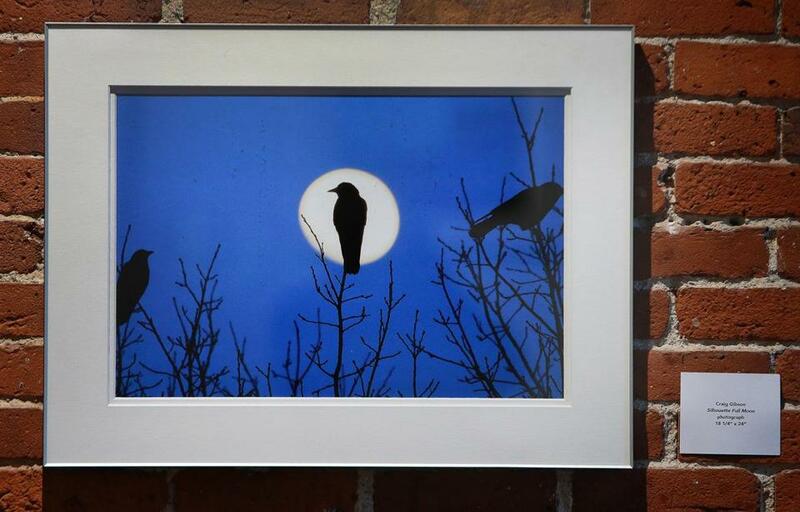 “Mystery of the Night Sky,” featuring works by local artists based on their own interpretations of crows, is on the community artist wall at the art center. McLaurin said the crow’s versatility as a symbol in art made the theme especially appealing. 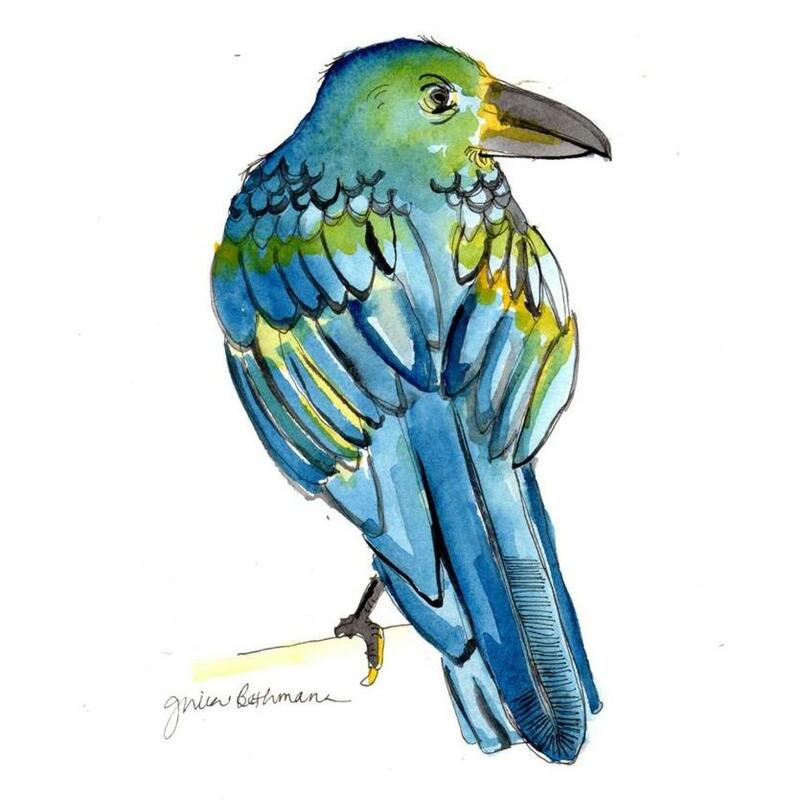 Julia Bethmann, an artist from Merrimac, felt crows conjured a feeling of “spookiness.” She submitted a watercolor painting she made last Halloween. “It’s a wise bird giving a prediction of what’s to come,” Bethmann said. The exhibition runs through March 15. The crows stop roosting about a month later. Essex Art Center, 56 Island St. #1, Lawrence, is open Monday through Friday from 10 a.m. to 6 p.m. Call 978-685-2343 or visit essexartcenter.org. For a guided walk of the crow roost, contact Dana Duxbury-Fox at danafox@comcast.net. Anne Thiam, a board member of the Essex Art Center, worked on hanging a piece on the Community Artist wall at the Essex Art Center. 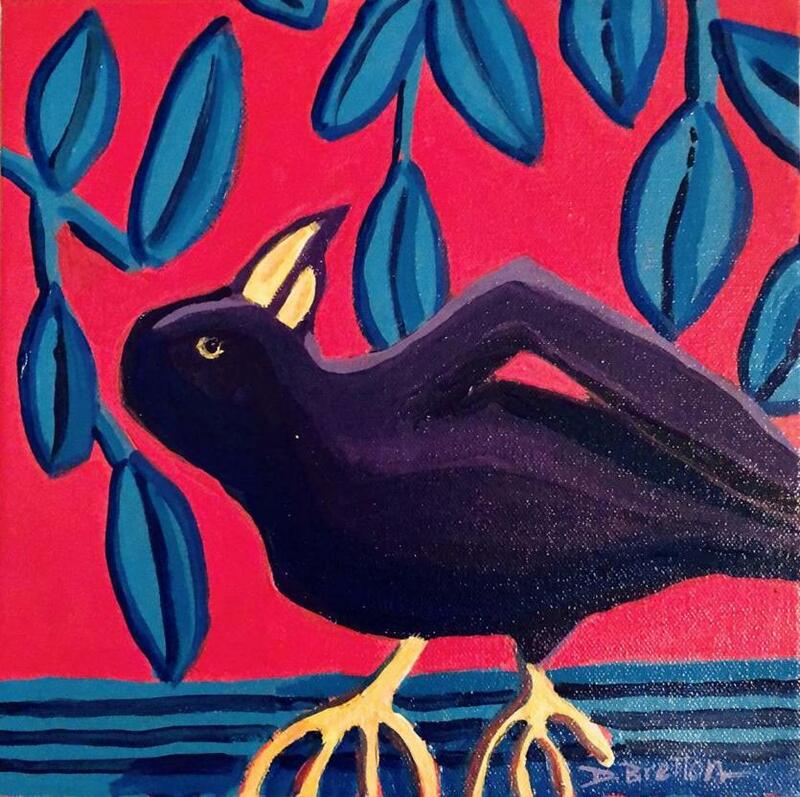 The oil on canvas painting by Eric Allshouse is titled "Crow Fight." Debra Bretton Robinson's painting is among those featured in "Mystery of the Night Sky" at the Essex Arts Center. A photograph by David Lipsy called "Motion Silhouette" hangs on the wall of the Essex Art Center. Julia Bethmann, an artist from Merrimac, submitted a watercolor called "Don't Look Back." Annika Hom can be reached at annika.hom@globe.com.